BigBasket Raises Rs 200 Cr Funding, Valuation Crosses Rs 1000 Cr! 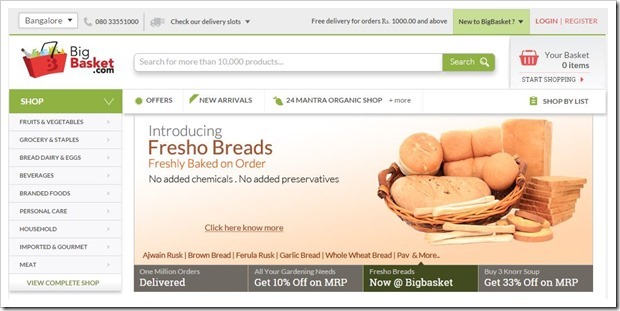 Bangalore based online grocery store BigBasket has raised Rs. 200 crore in fresh round of funding led by Helion Ventures and Zodius Capital reports ToI. With this fund raise, BigBasket valuation has now crossed Rs. 1000 Crore (approx $167 Million). The money raised will be utilized to improve customer experience. BigBasket was founded by VS Sudhakar, Hari Menon, Vipul Parekh, VS Ramesh and Abhinay Choudhari and started it’s operations in December 2011 with an initial investment of about Rs 5 crore from serial entrepreneur duo of K Ganesh and Meena Ganesh. Interestingly, both were also seed investors in Bluestone that announced personal investment from Ratan Tata yesterday. BigBasket had earlier raised their Series A funding of USD 10 million (about Rs 50 crore) from private equity firm Ascent Capital. With this round of funding, BigBasket has raised a total funding of Rs. 278 crore. BigBasket claims to have 12,000 products from over 1000 brands across several categories like groceries, fruits, vegetables, bread & bakery products, toiletries, branded food & non-food products, dairy products, household provisions, confectioneries and frozen food. They are planning to expand from existing 3 cities (Bangalore, Hyderabad and Mumbai) to 10 cities by the end of next year. Pune and Delhi NCR will come up in next 6 months according to BigBasket co-founder V S Sudhakar. According to ET, the company has crossed an annual revenue of Rs 250 crore and growing at 10 percent month on month. They currently execute over 5000 orders per day. Number of online grocery stores have cropped up over last couple of years. BigBasket faces competition from other online grocers like ZopNow, Aaram Shop and Farm2Kitchen. Big ticket funding in eCommerce space has now become a norm in India. Not a month passes by when we do not hear big fund raise from an eCommerce firm. This is good news for the entire ecosystem. When VC money flows in, entrepreneurs can take bigger risks and more often than not they result in bigger rewards. "BigBasket Raises Rs 200 Cr Funding, Valuation Crosses Rs 1000 Cr! ", 5 out of 5 based on 1 ratings.